This is a photo of Sean Brock's Farrotto with Acorn Squash and Red Russian Kale from his new cookbook Heritage. I've had my eye on this recipe since I got the book in October. And last night, I finally made it. 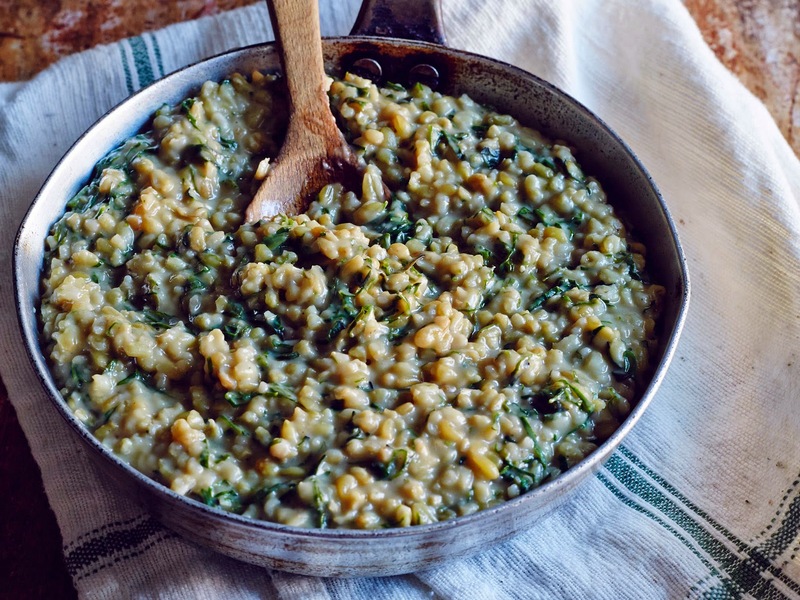 Farrotto is essentially farro, an ancient wheat variety, cooked slowly with stock like risotto. It gets creamy with a nutty, chewy texture. It's a pretty hearty dish, but better for you than arborio rice. Apparently, "it’s rich in the cyanogenic glucosides that stimulate the immune system, regulate blood sugar levels, and lower cholesterol." I didn't follow Brock's recipe exactly--because I am so horrible about following recipes & it was a week night--but my slightly altered version was quite delicious. Brock calls for toasting the farro in the oven and roasting the squash then pureeing it. I toasted the farro on the stovetop and just sautéed the squash in some olive oil with the onions & garlic. I didn't mind the chunkier texture. I seasoned the cooked farro with Herbs de Provence and added a little sour cream to finish the dish. I served the farrotto with a piece of simply seared cod on top (seasoned with salt & pepper and finished with lemon juice & butter). I don't have any pictures of my dish because I was too busy being smitten and googly-eyed over my new guy (together 10 weeks tomorrow, y'all), who came over for dinner. My upcoming classes include a few new menus: a Mother's Day brunch on May 10 (two words: doughnut muffins), a sushi class on May 16, and a Girls' Night Out class featuring dessert and cocktail pairings (two words: jello shots) on June 26 (two more words: butterscotch cupcakes). I have several Date Night for Couples classes, including a beer pairing class (March 29), a steak class (April 12), a comfort foods menu with rosemary fried chicken & caramel apple pie (June 7), and a summer supper featuring grilled chicken with bourbon bbq sauce (June 12). I'm also teaching my popular Harry Potter kids' class (which is sold out for the next 3 classes scheduled this spring) again on June 28. We'll prepare beer cheese fondue with soft pretzels, local lager with spicy sriracha chicken wings, fruity Belgian wheat beer with grilled scallops and Mexican corn salad, plus creamy stout with chocolate hazelnut cake & vanilla ice cream. Whether you own a Vitamix or are thinking about adding this powerful tool to your kitchen, this hands-on class is designed to optimize its strength, from piping hot soups to refreshing smoothies. We'll make blueberry-banana oatmeal smoothies, vanilla coffee frappé, horseradish cheese dip with baked pita chips, antipasto salad with Italian dressing, bread with freshly-made butter, avocado-tortilla soup, pasta with basil pesto and sun-dried tomato sauce, plus almond-peach sorbet. Bruschetta with seasonal fruit, brie and fennel-infused honey, smoked lentil salad with creamy sriracha dressing, cedar-grilled flat iron steaks with cayenne-coffee rub, sweet potato and goat cheese "tater tots", bacon-wrapped green beans with brown sugar and garlic butter, plus salted caramel pots de crème. Learn to cook with the wonderful flavors of wine in this class where you'll prepare mushroom-red pepper salad with red wine-herb vinaigrette, oven-roasted beef tenderloin with roasted red grape wine sauce, homemade black pepper fettuccine with chardonnay cream sauce, plus fabulous flourless chocolate-red wine cake with rosemary ganache -- all enjoyed with a glass of cabernet wine. Surprise Mom with a unique celebration of her day, as this class creates a tasty brunch of bacon waffle Benedict Florentine with hollandaise sauce, maple-glazed pork and apple meatballs, goat cheese Monte Cristo sandwiches, crispy herbed potato cakes, cinnamon-sugar doughnut muffins with espresso gelato, plus a grapefruit-mint mimosa. Tempura vegetables, miso soup, edamame salad with ginger-soy dressing, crab and mango inside-out rolls with teriyaki glaze, spicy tuna hand rolls, crunchy shrimp rolls with avocado-chile cream, & sweet plum ice cream. Discover the fun of cooking together, as this hands-on class prepares grilled panzanella salad, rosemary fried chicken, mac-and-cheese with peas and bacon, ratatouille, plus caramel apple galette, with two remarkable beer pairings ideal for dinner and dessert. Grab your partner and fall in love with the smells and flavors of summertime. This class will create "BLT" bruschetta with pepper-jelly bacon and tomato jam, classic Caesar salad with smoky shrimp and zucchini, grilled spatchcock chicken with bourbon barbecue sauce, crispy and cheesy hasselback roasted potatoes, plus blueberry pound cake with lemon glaze and limoncello gelato. Inspired by a trendy New York retro-style cafe and bar that serves cupcakes and cocktails, I'll serve up an outstanding selection of sips and sweets. Enjoy butterscotch cupcakes with scotch-lemonade punch, raspberry-bourbon gelatin shooters (because Jello shots are the original dessert and booze pairing), "Dark & Stormy" popcorn flavored with ginger, lime, & rum served with its namesake cocktail, s'mores pie with vanilla-orange prosecco cocktail, plus honey-nut shortbread with an espresso martini.